Andrew Young. Photo by Paul Davis. Two men who were present when the Rev. Martin Luther King Jr. was assassinated recently visited Cincinnati. The Rev. Jesse Jackson stood with Occupy Cincinnati at Piatt Park last November and urged the protesters to continue. When the Rev. 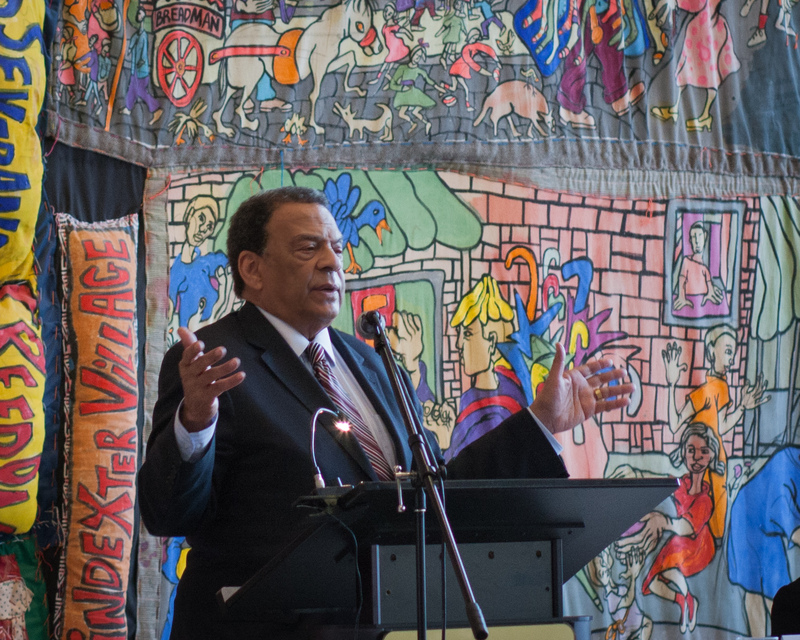 Andrew Young spoke March 20 at the National Underground Railroad Freedom Center, he had a different suggestion. The people involved in the Occupy Wall Street movement across the country need more education, he said. He contrasted the new movement, which touts the fact that it has no leadership, with the civil rights movement of the early 1960s. Young – former U.S. ambassador to the United Nations, former member of Congress and former mayor of Atlanta – was the keynote speaker at the annual YWCA Heart-to-Heart Racial Justice Breakfast. Young, however, preferred to point to another influence which, he said, was pivotal in shaping both his and King’s thinking about how to fight racial segregation: their wives. Both came from educated families that owned property, and both had that property taken away during their teenage years, he said. King’s wife went to Antioch College in Ohio, where she took a course on peace studies. Young’s wife went to Manchester College in Indiana, where a course on New Testament non-violence was mandatory. “Neither of us were particularly committed to non-violence, whereas our wives were. … Had it not been for the coming together of this dynamic, you probably would have never heard my name – or Martin’s, either,” he said. Women’s rights – and the lack of a movement to promote them – were a major theme of Young’s address. He described an encounter with a woman from an African country where genital mutilation is practiced. He quoted computer-equipment billionaire Bill Gates, who urged Saudi Arabia to end its repression of women. In Saudi Arabia, women are not allowed to leave their homes without the permission of male relatives. Gates was asked if technology would make the country great. “He said, ‘It depends on whether you utilize the talent that’s behind the wall. This should be and could be a great country, but it’s not as great as it could be because 45 percent of your population is still behind the wall,’ ” Young said. Walls of another sort keep too many women from contributing to American society, he said. Young described a visit to a women’s prison with 1,700 inmates. Many women in prison for drug offenses end up with harsher sentences than the primary offenders, their husbands or boyfriends, who often testified against the women in exchange for lighter sentences. The 1,700 women in that prison had approximately 6,000 children left without their care, just one illustration of the problems caused by mandatory sentencing and the nation’s high incarceration rate, Young said. Pointing to the growth of Atlanta during his three terms as mayor, Young said the key was a commitment by business and civic leaders to make sure economic growth benefited all parts of the community. Young called for a massive project to prevent flooding on the Mississippi River, which affected 33 states last year. He said public-works projects during the administration of President Franklin Roosevelt transformed the Appalachian region and helped millions of unemployed people. Much of the current political dialogue, with calls for smaller government and reduced spending, show a lack of vision, according to Young. Creative financing can use the nation’s wealth to benefit all segments of society, Young said. “You’ve got to figure out a way to use the money on Wall Street to feed the hungry, to clothe the naked, to heal the sick,” he said. His success in Atlanta – for example, building an international airport that is now the busiest in the country, generating $30 billion a year in economic activity, while making sure women, minorities and poor people benefited – shows that government and business can find a way, Young said.